Patricia Tavis is a 200-hour certified yoga instructor. She graduated from Blue Moon Yoga in Shrewsbury, New Jersey in 2009. 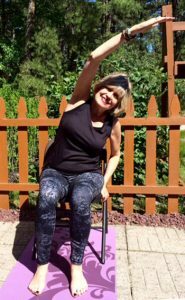 She has been happily teaching yoga since then, specializing in gentle, chair and special needs yoga. 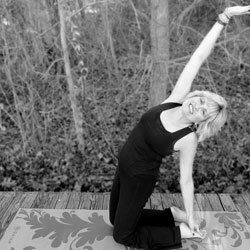 She is the owner of Serene Spirit Yoga, LLC in Howell, New Jersey. She teaches in various locations throughout central New Jersey. Her goal as a teacher is to make yoga accessible to everyone. When she is not teaching or practicing yoga, she enjoys reading, photography, traveling and taking ballet classes. She loves long walks in nature and horses. She lives at the beautiful Jersey Shore with her husband, two sons and adopted daughter from India. 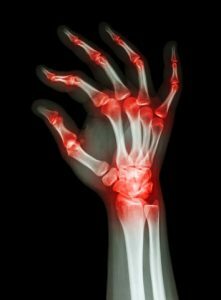 Arthritis is a painful condition characterized by swollen and inflamed joints. There are over one hundred types of arthritis. Osteoarthritis is one of the most common forms of arthritis as we age. It is caused by “wear and tear” of the joints and is a degenerative joint disease. It involves the wearing away of cartilage, the covering on the ends of bones where they come together to form joints. If the cartilage is completely worn away, it can result in painful bone-on-bone contact, causing restricted movement. X-ray adult's hand with multiple arthritis X-ray adult’s hand with multiple arthritis Arthritis can make everyday life very difficult. Even the simple act of walking can be a challenge when the joints are stiff and swollen. When it is painful to move, it can be tempting to rest and refrain from moving. Unfortunately, this will only worsen the symptoms of arthritis. Gentle exercise, especially some types of yoga, can be beneficial in easing the troublesome symptoms of arthritis. Circular movements help the ball-and-socket joints relieve stiffness. They increase synovial fluid, which reduces friction between the cartilage of joints during movement, to nourish the joints. Gentle, circular movements help circulate blood to ligaments, tendons and muscles. Chair yoga offers many of the same benefits as a standard yoga practice. If you have not exercised in a long time, are recovering from an illness, or simply have trouble getting up and down from the mat, chair yoga gives you the opportunity to practice yoga. Before embarking on any exercise program, you should check with your doctor. Always keep in mind that yoga should never hurt. If a pose does not feel right, do not force your body into the pose. If you feel dizzy or have trouble breathing, stop immediately. Always do chair yoga in a sturdy, armless chair on a non-slip surface. Make certain there is enough space between the front and back legs so it will not tip over. Your feet should be flat on the floor, but you could place a book under your feet if they do not reach. The chair should measure at least 30 inches at the back and 17 inches at the seat. For those over 5’8”, there are chairs that measure 35 inches at the back and 21 inches at the seat. Breathe smoothly, in and out through your nose. Here are eleven poses suitable for all ages. Do you think you are too old to begin a yoga practice if you are over 50? The good news is that you are not! You are never too old to begin yoga! In fact, yoga just may be the key to an active lifestyle as we age. Here are 5 great reasons to begin practicing yoga if you are over 50. 1. Greater strength and flexibility Loss of muscle and bone strength is a natural result of aging. A sedentary lifestyle can accelerate these changes. Gentle weight-bearing yoga poses can slow the loss of muscle tone. Yoga teaches correct postural alignment, reducing the stress on muscles, bones and joints. Gentle stretches aid in flexibility and reduce joint pain and stiffness. Yoga can help reduce the symptoms of osteoarthritis and aid in increasing range of motion of the joints, decreasing the likelihood of injury.